This is a handheld microscope commonly called a 'compass microscope.' It has a single lens, and there is no case with it at this time. It measures about 125 mm long, excluding the Lieberkuhn reflector and about 130 with the reflector. The reflector itself is 27 mm in diameter. Many similar known similar instruments have cases covered in fishskin and lined with green velvet, which has been used to date them to the third quarter of the 18th century. This instrument however is almost identical to examples provided as part of the 'Jones Most Improved model' sold by W & S Jones in the late 18th and early 19th centuries. This instrument is also quite similar to those in Bracegirdle's Science Museum CD (numbers 3-23, 24, 25, and 26). Another very similar, and nearly identical example is in the Golub collection, dated to the second quarter of the 18th century, but this dating may be too early, as the Lieberkuhn reflector was not being made in England until after 1838, and as noted, it is seen included in kits with much later, early 19thinstruments. The handle is ivory. The specimen holder has a forceps on one end, and a black & white disk on the other, which when removed, reveals a spike. There are two joints, one allows the specimen to be moved closer or further from the lens for focusing, the other allows lateral motion. The specimen holder can be moved through its brass support so that the object being studied can be centered separately from the focusing movement. This is important, as the arc of rotation during focusing will move the object out of the field of view if the movement is significant. The instrument relies on friction to allow fine movements. This is surprisingly satisfactory. 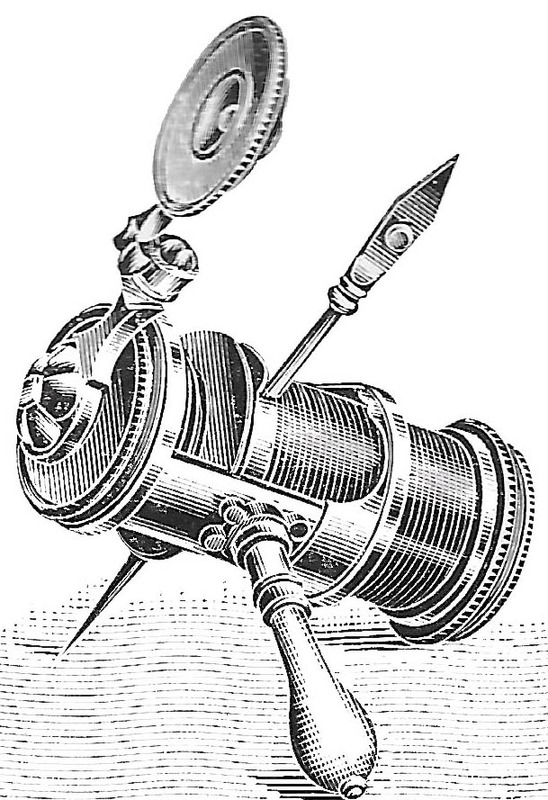 The 'compass' microscope gets its name from the joint of the drawing instrument, though it was never called that during the years it was produced. One could argue about the origin of this type of instrument, for some of its features may date back to Van Leeuwenhoek's time. Gerard Turner has called Van Muschenbroek's high power handheld microscope a 'compass' microscope, but I would let the reader judge for themselves. It seems the only similarities to the first examples of what we would now call 'compass microscopes' are the fact that it is handheld, and that the focusing is adjustable via a screw acting on a hinged arm. This type of focusing mechanism, that is a screw acting against an arm given tension by a spring, was used on the earliest examples of compass microscope, and this may the the reason that Turner related the two types. Many authors have noted that James Wilson, 'popularizer' of the Screwbarrel microscope, may be the first to be credited with what we now call the 'compass' design. 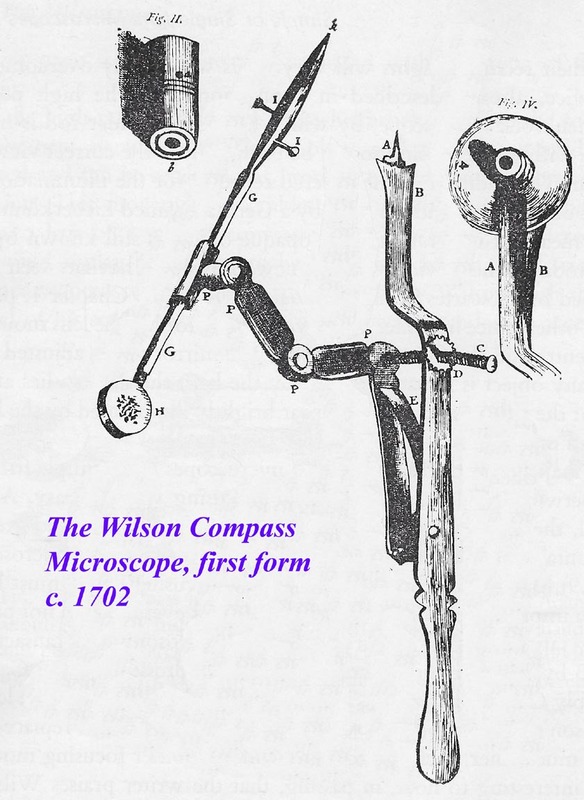 It is notable however that the Muschenbroek high power model and Wilson's first version of compass microscope were first made at about the same time. If one goes to the earliest description and illustrations of Wilson, one finds in 1702, his earliest known form (left). In this form, the compass microscope had a single flat plate of brass as its main support including the 'handle'. The different lenses (higher and lower power) attached to a spike, similar to some earlier instruments. A springy piece of metal on the other side of the lens, noted as 'B' in the figure, served to hold or steady the lens in place. This microscope was criticized in the literature of its time for its coarse threads for focusing, and its flimsy design, but the quality of its lenses, was commended. As of 2016, the author knows of the existance of only one example of this form of compass microscope in a private collection. One should keep in mind that the idea of using a screw to adjust the focus of a handheld instrument was well known before this, having been used in some fashion by Van Leeuwenhoek and likely others. There is a replica of Van Leeuwenhoek's instrument on this web site. 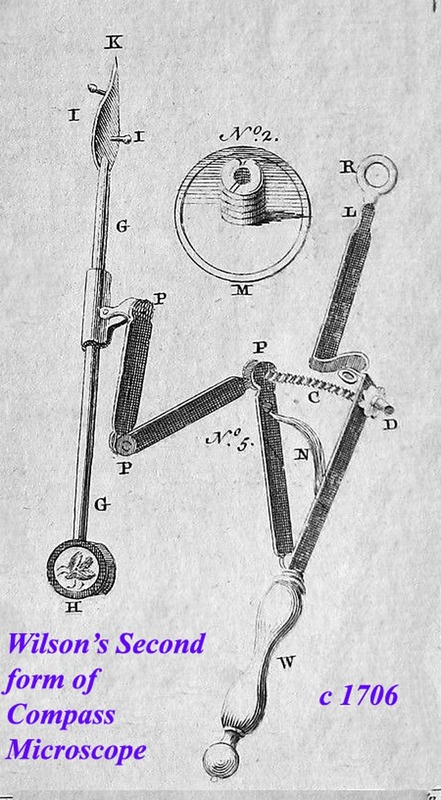 In Wilson's second form of compass microscope, described only four years after his first, the design had changed to include a turned brass handle (which could also be used with the screwbarrel microscope), and the lenses now screwed in to the instrument instead of being stuck on a spike. Examples of this design also are known today; one can be seen imaged from the Giordano Collection in the Singular Beauty Catalog. To our knowledge, Wilson only supplied these compass microscopes as part of his Pocket Microscope kit, which also contained a screwbarrel microscope, and they were no longer needed when he devised his opaque attachment for the screwbarrel which then made use of the screwbarrel's focusing mechanism, which moved the stage and hence the specimen holder (see below). 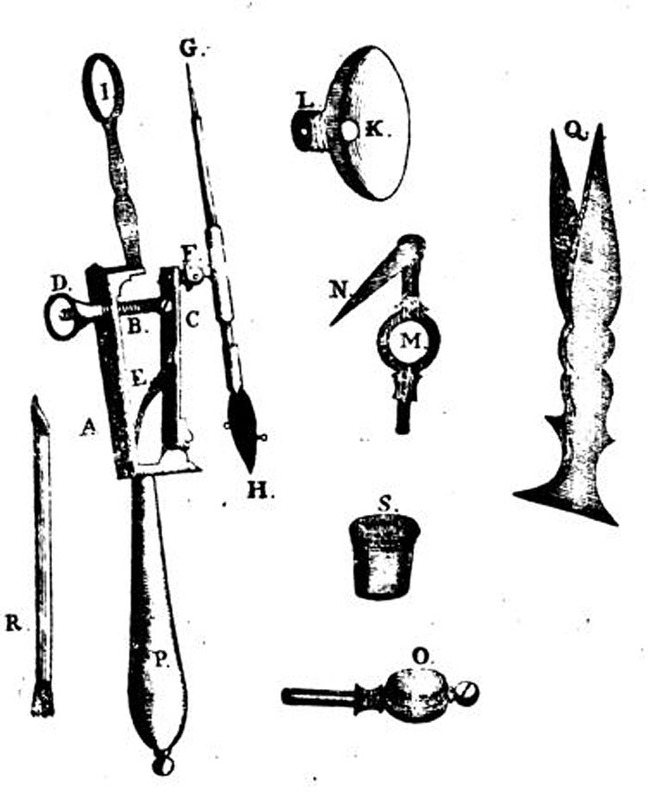 About 1710, Wilson started to produce an opaque accessory(left) for the screwbarrel microscope which then made it unnecessary to include a compass microscope with it. This type of accessory was copied by the other makers and thus became quite common. Although the 'compass microscope' was around from the earliest years of the 18th century, compass microscopes that more closely resembled a compass were produced a little later, some handheld and some on some kind of base. The example shown to the left has been dated to the 2nd quarter of the 18th century. The visualization of opaque objects with a microscope becomes a challenge particularly as magnification is increased and therefore focal length is decreased. This limits the amount of illumination the object can receive that would still be reflected in the direction of the eye. One way around this is to construct a reflector around the lens facing the object. This reflector is designed so that, at the focal length of the lens, the reflector focuses light from beyond the object back down onto the object. This idea dates back to Descartes in 1637 and also to Van Leeuwenhoek. The idea was not pursued much however until Johannes Lieberkuhn popularized the idea in Europe and then England in about 1738. It was John Cuff who was apparently the first in England to latch on to this idea and by the early 1740's was producing an improved compass microscope which is pictured to left and he called his 'Microscope for Opake Objects'. The instrument has a hinged focusing system with a spring to hold it steady against the adjusting screw. Cuff apparently sold these in a kit along with the Screwbarrel microscope, and also in a kit of their own, usually with several different Lieberkuhn lenses. Cuff also adapted the Lieberkuhn to his new improved type of compound microscope that now bears his name-the 'Cuff-type' Microscope. He did this by attaching the reflector to the end of a tube which fit around the nosepiece. Following Cuff's lead, English makers proceeded to use the Lieberkuhn reflector on many handheld microscopes. Famous makers likely included Benjamin Martin, George Adams, and later, W & S Jones. The Cuff-designed screw fine focusing mechanism on the early versions was carried on in some examples by some makers like Adams. Soon however, versions without a screw fine focus were made, depending mainly on friction joints for focusing, and the example at the top of this page is one of those. Hand held microscopes without provision for fine focusing soon after included the Folding Insect/Botanical types which featured a sliding support focus which eliminated the problem of displacement out of the field of view as focused, a problem that had plagued the compass microscope; many of these reverted back to lacking a Lieberkuhn though. Cuff's model of compass microscope continued to made for many years after his death. The model shown at the top of this page is the model that followed it. It was sold individually in a kit with additional Lieberkuhns and was also included in larger sets like the Jones Most improved model of the early nineteenth century. It was likely made through at least the first quarter of the nineteenth century, when the sliding focus Folding Insect/Botanical Models became much more common. Although some have referred to these folding instruments as 'compass' microscopes, they no longer resemble that design. The author is grateful to James Solliday and Dr. Joseph Zeligs, for helpful suggestions and some historical information provided on this web page.